Congratulations to husband-and-wife writing team Chris Baker and Pasuk Phongpaichit, winners of the Fukuoka Grand Prize for 2017. 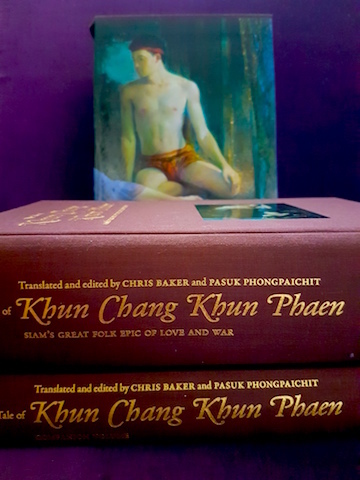 Over the years several of their books have been in the Lotus & Persimmon collection, but currently only their magisterial translation of the epic 18th century Thai poem Khun Chang Khun Paen is on the shelves. The lavishly bound and boxed edition of Khun Chang Khun Phaen in the Lotus & Persimmon collection. The couple, she an economist, he a historian, met at Cambridge. After Dr. Phongpaichit completed her PhD, they settled in Bangkok, where she took up an academic appointment at Chulalongkorn University. During his initial years in Bangkok, Mr. Baker worked in advertising and other businesses, and also became fluent in Thai. He has been a full-time writer for the last 20 years. Their joint books are History of Thailand, Thaksin: The Business of Politics in Thailand, Thailand's Boom and Bust, and Thailand's Crisis. Socio-economic inequality is a theme of their books, as is the intersection of money, business, and electoral democracy in contemporary Thailand. The pair have been longstanding critics of former prime minister Thaksin Shinawatra. In fact, they were probably his earliest critics. I was saddened to read in an interview published in today's Bangkok Post that Dr. Phongpaichit no longer feels as safe to speak out and write as she did earlier in her career. You can read the interview and profile here: http://www.bangkokpost.com/lifestyle/book/1271375/dissecting-a-nation. As a translator myself, I'm most impressed by the team's work on The Tale of Khun Chang Khun Phaen. Not only is it long, the English version clocking in at over 1400 pages, but the original is written in difficult verse and full of archaic language. The cover of Khun Chang Khun Paen. The poem follows the adventures and vicissitudes of two men, Chang and Paen, who are boyhood friends in Suphanburi. The tale rests on the universal dynamic of unequal friendship -- Chang is rich, Paen is not -- and later a love triangle involving the lovely Lady Wanthong. 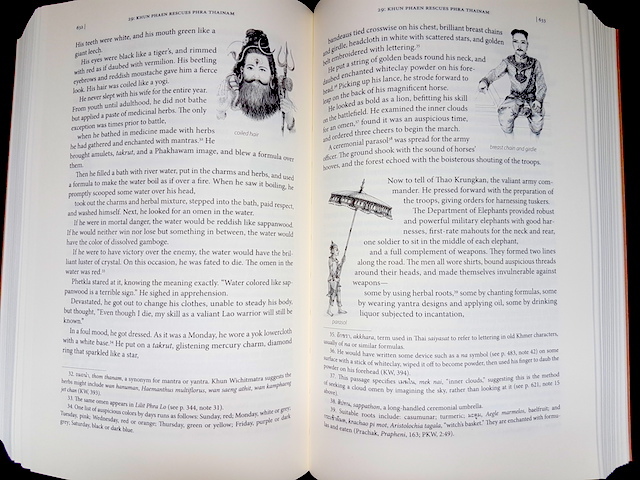 The text is embellished with illustrations by Thai artist Muangsing Janchai. The tale has been told for centuries, but it was only written down early in the Bangkok era, i.e. the early 19th century. It has been filmed 5 times and adapted for TV numerous times, not to mention re-told in modern prose. Wikipedia claims that 7 different prose treatments have been published. A cultural touchstone, the poem is taught in Thai schools and its famous episodes are frequently referenced in contemporary popular culture. 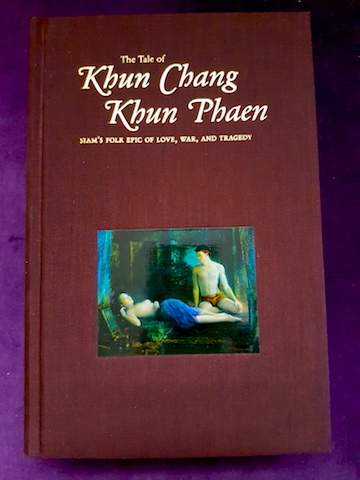 The cover of the companion volume to Khun Chang Khun Paen. Baker and Phongpaichet were awarded the prize for the body of their work. The Fukuoka Grand Prize is conferred each year in September. According to the Fukuoka Prize website, the prize was established by the City of Fukuoka to recognize individuals or groups who have made "outstanding contributions to the preservation and creation of Asian culture and have exhibited the significance of Asian culture to the world through the internationality, universality, popularity and/or creativity of their work." An Academic Prize and Arts & Culture Prize are also awarded. The Grand Prize winners are selected from among all the finalists for the other 2 prizes. Previous Thai winners include film maker Apichatpong Wirasetthakhun (Arts & Culture) and art historian M.C. Subhradis Diskul (Grand Prize). Congratulations to Mr. Baker and Dr. Phongpaichet! Have you read any of their works? Please share your impressions in the comments below, on our Facebook page (https://www.facebook.com/lotusandpersimmon/) or in our gallery on Instagram (@lotusandpersimmon).